The latest news on the poisoning of the Russian colonel Sergei Skripal and his daughter Yulia brings another twist to the story. The nerve agent which poisoned a Russian double agent was planted in his daughter's suitcase before leaving Moscow, it has been reported. Whatever the conspinuts say, the nerve agent was traced back to Moscow. Not that this will deter the seekers of "real truths". 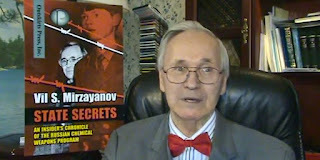 For the rest of us, I am translating* here an interview with Vil Mirzayanov, a scientist and later head of Foreign Technical Counterintelligence at the State Scientific Research Institute of Organic Chemistry and Technology (GosNIIOKhT) in Moscow in the 1970s and 1980s, which produced the shadowy class of binary nerve agents known as the “novichoks” (newcomers). The reason for this translation: there are several other interviews in English with the man, however in all cases the interviewers were too lazy or too unprepared to ask the right questions. The reporter for Voice of America has done a better job. (The headline of this post is, in fact, a translation of the title of the article in question). The world learned about the existence of the nerve-fighting poisonous substance "novichok" from Vil Mirzayanov. In 1992 he wrote an article "Poisoned Politics" for the newspaper Moskovsky Komsomolets. Mirzayanov was arrested twice, but the case against him collapsed before coming to court. The chemist went to the US, where he wrote the book "State secrets: the Russian program of chemical weapons from the inside." In his blogs, he argued that Washington was extremely unhappy with the publication containing complete chemical formulas of the poison agent. Since 1992, Mirzayanov tried to achieve the ban of "novichok" as a chemical weapon, but failed. The substance officially still does not exist. Where could have British chemists got samples of the "novichok", which country could organize the production of this nerve agent, how long the chemical weapons are stored, why Moscow insists on actions "in strict accordance with the Convention on the Prohibition of Chemical Weapons," - Vil Mirzayanov tells in an interview for Russian service of the Voice of America. - You have participated in the development of unique Soviet chemical poisons - nerve agents, known today as "novichok". At the same time, you argue that there is no such weapon in any country in the world, except Russia. How did British investigators find out which substance was used to poison Sergei Skripal? - In order to establish what "preparation" was used in this case, you need to have access to a powerful high-resolution mass spectrometer, in the "library" of which there are spectra of all compounds known to date. The sample taken is compared with those already known, and the computer indicates the spectrum with a 96 percent probability. That's it, there can be no mistake here. - But for this purpose the investigators should have some kind of sample? - These are the usual procedures. You can take blood, urine, extract the sample from clothes with the help of solvents. There are many ways. - Russian officials have repeatedly stated that the chemical used to poison former colonel GRU Sergey Skripal could be produced in other countries, including the UK. You say that in England there were samples of the "novichok". - The British could synthesize it on the basis of the formulas that I published in my book in 2008 [State Secrets: An Insider's Chronicle of the Russian Chemical Weapons Program Secrets .- VA]. Each country takes care of its own security independently, and in the study of potential threats it was possible to create a sample. So that samples could exist in many countries, but production was set up only in the USSR and Russia. - Have you published these formulas completely? - Completely. I suspected that something like that [an attempt on the Skripal - VA] could happen, and therefore for a long time, since 1992, I tried to include "novichok" in the list of officially banned chemical compounds. But this can only be done by the Organization for the Prohibition of Chemical Weapons (OPCW), having an agreement on this decision with all the member countries of the convention. After my book was published, this issue was discussed at a meeting at the OPCW headquarters and, to my knowledge, no decision was taken. - The head of the Russian Foreign Ministry, Sergei Lavrov, responding to the claims of the British side, accused London of non-compliance with the requirements of the Convention on the Prohibition of Chemical Weapons. - The OPCW, within the framework of this Convention, can only work with compounds that are on the list of banned substances. "novichok" is not on this list, and, therefore, the headquarters of this organization does not have methods for recognizing the "drug". - You have announced the existence of "novichok" in 1992 for the first time. These weapons could have been improved since then? How can you be sure that in this case we are not talking about a completely different compound with similar characteristics? - Of course, it could have been improved, but the "skeleton" of the drug remains unchanged. "novichok" differs from all, without exception, nerve gases in that it is based on the connection of phosphorus and nitrogen. All other poison agents do not have such a connection, so "novichok" is a fundamentally new class. - "novichok" was created in the State Scientific Research Institute of Organic Chemistry and Technology (GONIIOKHT) back in the late 1980s. While working on this project, you have assumed that it could be used in such cases as the "Skripal affair"? - In Soviet times we always worked together with the KGB. When Markov [the Bulgarian writer Georgy Markov, killed in London in 1978 - VA] was killed, ricin, obtained in our laboratory, was used in the assassination. But we did not engage in tools of murder, for this purpose the KGB had its own laboratory. - Russian officials claimed that the "drug" you created could be found in the republics of the former USSR. As a possible source, for example, they have named Georgia and Uzbekistan. - This is empty talk. The Soviet Union collapsed 27 years ago, and if somewhere in the republics there was a clean "novichok", it had long since disintegrated and would not do as a weapon. Any chemical poisoning agent decomposes. There is no compound that retains its properties for a long time. In the first year, 2% is lost, in the second year - 3%, and the resulting decomposition products accelerate the decay process. That is why the storage and disposal of toxic substances is a big problem, which, moreover, is more expensive than production. - Yes. It is because of the difficulties in storing and recycling that today nobody will produce the so-called "final product". Instead they produce components, relatively harmless individual components, which are mixed immediately before use. - And such production can be hidden? - Yes, for example, simultaneously with the development of a promising substance, when stage-by-stage tests are already under way, an agricultural pesticide is being developed, which in its characteristics basically repeats this substance. That is, the production of so-called "subproducts", which are components of binary weapons, can be conducted quite officially. At some enterprise they can carry out a plan for the production of pesticides, even without realizing that they are actually producing chemical weapons. - From your point of view, how easy it is to transport such substances across borders and then use them? - It's not very difficult. You need two glass ampules, some high-pressure agent, for example a light volatile gasoline. Ampules must be broken before use, and the mixed substances will give the desired compound. Then, as an aerosol, it can be sprayed. But this is a very crude option, and I'm sure that the FSB could come up with a more sophisticated way. - You think that the attempt on ex-colonel Skripal was "emphatically demonstrative." That is, the culprits counted on the fact that traces of the "novichok" will be found in advance? - I do not think so. This was really a demonstrative punishment, but in my opinion, Moscow was sure that no one would find traces of the substance. This "drug" does not officially exist, it is not mentioned in any of the lists of the Organization for the Prohibition of Chemical Weapons. Since almost 30 years ago, no one has been engaged in its development. It is obvious to me that Moscow was counting on the fact that no one will catch them. - But you have published the formula of "novichok" eight years ago. - I do not know whether the FSB saw my book. Perhaps in one of the departments it was read, but in the other one, which was preparing the attempt, they did not hear anything about it. - After the incident with Sergei Skripal, representatives of the OPCW or of any international organizations approached you as one of the creators of the "novichok"? - No, nobody approached me, except journalists. (*) With kind assistance of Google Translate, for the bulk of the material.